The portable Bluetooth speaker scene has recently exploded with popularity and now there are dozens of brands making all sorts of speakers. This means two things. First, it has created a tough competition which results in a dynamic development, innovation, extra features and most noteworthy – lower prices. Second, there has never been more options available on the market, which makes it tricky to pick the best from the rest. So, how do you cut through the noise to find the best portable Bluetooth speaker 2019 has to offer? 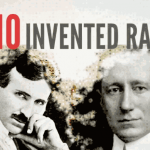 For their relatively short history, Bluetooth speakers have managed to come a long way. They are a no longer a generic type of speaker that just plays music, they do so much more. As you will discover, some speakers are now waterproof, some can charge your phone, some have virtual assistants integrated and some have a fancy light show built into them. This takes us to an important point before we can start reviewing some of the top wireless speakers of 2019 – you need to be clear on how will you use your speaker and what would be your budget? Being clear on your requirements upfront will narrow down your choices and consequently, make the selection easy. We keep updating this article as new choices and models become available on the market, so you can be assured that you are presented with the most current alternatives available. Alternatively, If you are after the best portable radio reviews, we have just finished putting them through the test. If you are short on time and not able to go through the detailed description of all the wireless speakers in our review, we have prepared a table summarizing main wireless speaker characteristics you need to make your decision. If you need a more detailed comparison, you will find it in the table at the bottom of this page. Premium build, material quality, sound and like anything from Bose – a price tag too. In return, you get one of the most refined portable wireless speakers on the market. Very big on sound, not as much on portability. It takes all the sound inputs you may ever have and delivers a deep, punchy sound. Not ideal to carry around, but for indoors, you will struggle to find a match. One of the toughest portable wireless speakers in our review. Water, dust, dirt and impact resistant which makes it ideal for travel or active use. One of the best sold portable Bluetooth speakers ever made. Great all around package that is durable, waterproof and sounds great. Best battery life wireless speaker hands down. Up to 40 hours of great sound quality and stylish looks. You can change ‘jackets’ to add more ruggedness to an already versatile and tough Bluetooth speaker. Similar to UE Boom 2, JBL Flip 4 is a great multipurpose Bluetooth speaker. Decent sound quality, plain looks, good protection, and the highest water resistance rating. Delivers bigger sound than its size. A tough and fully waterproof body that can float in water and play music at the same time. Great Bluetooth speaker for parties. Large size Bluetooth speaker for bass lovers. Not the most portable choice, but delivers a large sound experience at an affordable price. It can charge your other portable devices too. Toughness, sound quality, and portability meet in style with five different color options. Amazing sound quality for the size, yet an average battery life. The best value Bluetooth speaker we could find under $30. It comes in four color options and rugged design that can take some real beating. The moment you have SoundLink Revolve+ in your hands you just know that you are up for a very special experience. The body represents a cylinder which looks like a lantern. It is made of a high-grade anodized aluminum giving the speaker a premium feel to go along with its premium price tag. Around the bottom part of the speaker body, you will find holes that ensure a 360 degree sound distribution. The top and the bottom ends are made of high-quality, impact resistant plastic that protects the speaker from physical damage in case of a fall. The handle is made of a high-quality fabric, which has a premium feel and is quite practical at the same time. The speaker comes with IPX4 water resistance rating which provides sufficient water protection for general use. Although you cannot submerge the speaker in water, it is protected against splashing water and rain. You also get a built-in microphone which you can use to make voice calls or summon your phone’s virtual assistant, such as Google Now or Siri. According to Bose, they have integrated a quite innovative design consisting of two opposing radiators with a powerful downward facing transducer and a new, patented deflector. As a result – the speaker emits a powerful, 360-degree omnidirectional sound which is simply stunning. It is loud, clear and punchy with no distortion even at high volumes. I actually won’t hesitate to say that this is the best sound you can get in this size, period. The SoundLink Revolve+ comes with a handy app that allows you to control connections with multiple devices or to pair multiple speakers to a single device to create an immersive stereo experience. Talking about drawbacks, we feel it is too expensive, even considering the sound quality that it produces. At the same time, all Bose products are usually expensive, and by their measures, this speaker compares quite adequately. We would also like to see the charging cradle/stand to be included in the package, given the price point, yet it retails separately. Overall, if we had to put the small drawbacks aside, the SoundLink Revolve+ is the best sounding Bluetooth speaker to date. We do not say this lightly as we were genuinely amazed by the sound quality and the power this reasonably compact portable speaker was able to produce. Quite frankly – the best portable bluetooth speaker the money can buy in this size. 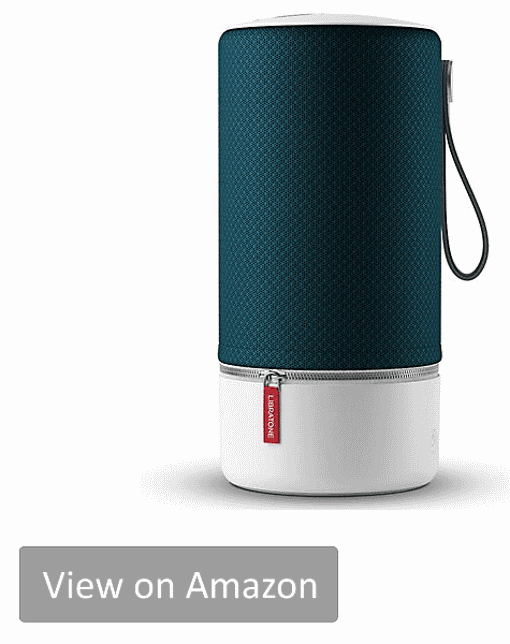 The Libratone has released an updated version of their Zipp line which is the most stylish Bluetooth speaker we have ever reviewed. The Libratone Zipp maintains the shape of its predecessor, which is a cylinder with a detachable cover that comes in 7 different colors. It also has a comfortable handle and despite being the heaviest Bluetooth speaker we have reviewed – it still feels reasonably portable. The speaker size and the quality of materials seem to suggest and favor the indoor use over the outdoor, yet taking using it in your backyard is just as welcome. The Zipp sounds a lot bigger than it is and in terms of an audio output quality, it reminds us of SoundLink Revolve+. It produces a 360-degree omnidirectional soundstage which is warm, full-bodied, immersive and powerful. The body packs in a 4″ woofer, two 1″ tweeters, and two 4″ low-frequency radiators. 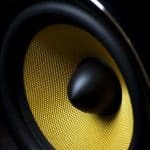 The most prominent and noticeable trait in the sound character is the deep bass. It makes you wonder – how have Libratone managed to pack so much punch in a size so little. The sound is so vibrant and loud that it can quite comfortably fill a large room with close to the stationary system sound experience. Regarding the input options available, the Zipp is miles in front of anyone else on our list. It features AirPlay, Wi-Fi, DLNA, Bluetooth, mini-jack, USB, 3.5mm and even Spotify Connect support. Have we missed anything? You also get an app that comes with the speaker that allows you to do some pretty cool things. The main feature is that you can connect multiple Zipp speakers (including Zipp Mini) to create what Libratone calls a ‘SoundSpace‘. You can connect up to six speakers to a group and have up to eight groups. This allows you to create a multi-room setup where you have all the speakers playing the same music, or have different music played in different rooms. With all the great things we said about the Zipp – it also has some flaws. The battery lasts for 10 hours, which is quite modest compared to the competition and when it goes flat, you need a proprietary charger to have it recharged. The other thing that has ruined a big part of our excitement with Zipp is the touch controls. The swipes and taps just would not register, and there are only so many times you can press the same button before getting annoyed. In conclusion – the Zipp represents a very solid package with many things to like. It produces an exceptional sound quality and looks unique. The number of audio inputs and streaming options is simply exhaustive. In fact, the Zipp is one of the biggest and loudest Bluetooth speakers we have ever tested which makes it less portable than other wireless speakers in our review. If you need a speaker that will be predominantly used indoors, ideally in a multiroom setup environment – the Zipp is an amazing choice that will make you reconsider what the best Bluetooth speakers are capable of. The Hypergear Beast XL looks heavy duty and that’s because it really means it. It was specifically designed for active outdoor use and has an IPX6 rating which makes it capable to withstand powerful water jets and heavy seas. Although it is not certified for solids protection, the durable body and grills are designed to protect the unit from sand and dirt just as well. The rugged body is made of the soft and durable plastic designed to absorb physical impacts. The speaker controls are pretty straightforward and feature big buttons making it easy and intuitive to use. The chassis features five dynamic drivers consisting of two passive bass radiators, two acoustic tweeters, and one integrated subwoofer. With such an array of drivers, the Hypergear Beast XL produces a remarkably powerful, clear and balanced sound. The audio quality stays relatively consistent throughout the volume range as the speaker has an anti-distortion circuit built-in. The 6600mAh battery provides a very reasonable 16 hours of playtime, so you can be sure that it will last the whole day of non-stop playing. There is not much to complain about Hypergear Beast XL except that it may come across as a little bulky for some. It is not the most versatile speaker in our review and it is not trying to be one. What it has been designed to do is to provide a quality audio experience in tough conditions, such as next to the pool, on the beach or anywhere with dust or dirt. It accomplishes that in style and delivers on the promise. 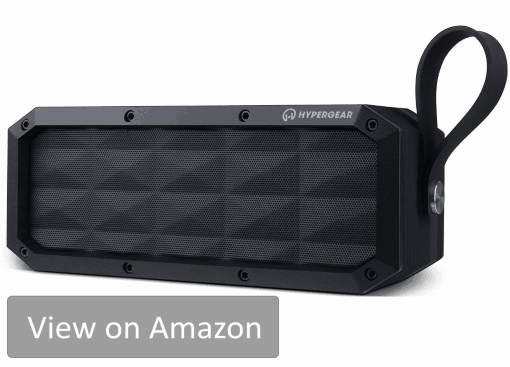 If you are someone who likes adventures or active sports with some exposure to water or dust, the Hypergear Beast XL is one of the toughest portable Bluetooth speakers around and is set to be your great companion. Boom 3 is the latest incarnation of the most popular UE’s Bluetooth speaker in the lineup. Despite its flaws, Boom 2 appealed to many and was regarded as one of the best selling portable speakers ever made. Can Boom 3 live up to the elevated expectations? It sure can! UE has decided not to redefine the ultimate Bluetooth speaker but instead stick to the winning formula and add some cool new features. The first thing you notice about the updated Boom speaker is that it has increased in both size and weight. Despite being bigger, it still feels portable and can be carried around in a backpack. One of the main enhancements of Boom 3 is the updated aesthetic. UE has swapped out the old mesh covering with a high-performance fabric originally designed for fire equipment and motorcycle jackets. As a result, it adds a great sleek look and dramatically improves the durability of the speaker. The speaker now features the IP67 dust-proof and waterproof rating that allows the speaker to get submerged under water for 30 minutes. 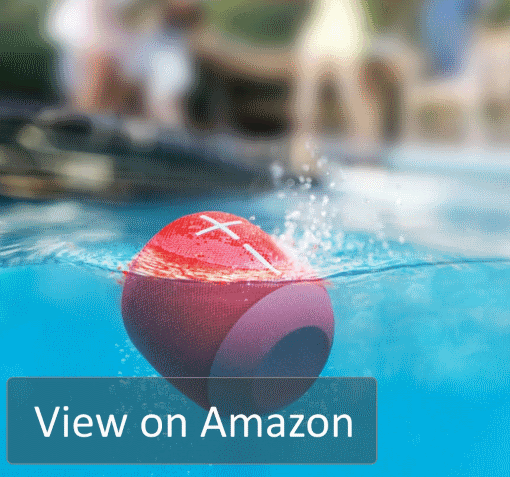 In addition, just like Wonderboom, Boom 3 can float in water. Not sure how practical this might be for consumers, but if you are up for some pool time and feel like you could add some music to the mix, Boom 3 is fit for the job. You will also find the new ‘magic button’ on the top of the speaker which allows you to pause and skip tracks. Unfortunately, it only works with Apple music and Deezer Premium which leaves Spotify and other music streaming platforms out. The speaker features a 360-degree sound similar to previous Boom models. It allows you to place the speaker in the middle of the room and enjoy even sound distribution. The overall sound experience can be described as loud and dynamic yet clear and relatively balanced. The speaker packs plenty of punch driven by two 2-inch drivers and a pair of 4-inch passive radiators. It does feel, however, that lows come slightly emphasized in the default setting. Thankfully, you can always change the equalizer settings to your liking using the Boom app. There are four different sound presets to choose from as well as an ability to fully customize the EQ. The app, however, has not been updated for some time and feels a little dated now. Lastly, Boom 3 connection range improvements have made it one of the best Bluetooth speakers for parties. The speaker range has been increased from 100 to 150 feet keeping the battery life at a respectable 15 hours. Don’t forget that you can pair additional Boom speakers together if your party needs some extra punch and volume. Boom 3 is a great successor to one of the best Bluetooth speaker lineups to ever hit the market. It takes the winning formula of Boom 2, adds a sleek, yet durable design, enhanced waterproofing and a cheaper launch price. Overall, whatever your need is, you can’t go wrong with UE Boom 3, it is one of the best portable Bluetooth speakers of 2019. The Fugoo Style, as the name suggests, is a stylish yet durable Bluetooth speaker that delivers a surprisingly stunning audio performance. On the outside, the speaker features a modular ‘jacket’ concept where the jackets can be interchanged based on your style, function or both. There are three types of jackets to choose from – Style, Sport and Tough with the latter one featuring the strongest body that can withstand drops and reasonably strong phisical impacts. The ‘Style’ jacket looks neat and has an ‘indoor’ feel to it. The ‘Sport’ jacket mostly features rubber materials that add a layer of additional impact protection. It also allows the optional accessories to be attached such as strap or bike mounts. The ‘Tough’ jacket features a heavy-duty design and function making your Fugoo speaker almost indestructible. Irrespective of the jacket you chose, your Fugoo speaker comes with IP67 rating making it one of the most durable portable Bluetooth speakers 2019 has to offer. The speaker is snow, water, dust and mud proof that can be submerged in one meter deep water for up to 30 minutes. This makes the Fugoo Style tougher than most of the ‘tire block’ speakers out there that look like they could survive a nuclear winter. The sound performance is yet another area where Fugoo Style delivers some truly incredible results. It features a six driver design with two tweeters, two mid/low range, and two passive radiators. Those drivers are symmetrically placed to allow a 360-degree sound. Remarkably, the audio performance produced by Fugoo Style is very balanced with clear highs, mids, and lows. The speaker does not favor any particular frequency range, hence bass lovers may lack the low-end punch. If that was not enough, the Fugoo Style throws in the longest battery life available on the market into what already is a pretty compelling package. The speaker can go for 40 hours on a single charge if used at 50% volume. That is double the battery life compared to the rest of the competition! The advertised 40 hours, may not always be practical, but based on our testing 30 hours and over would be more than a reasonable expectation. The Fugoo Style is the speaker that has surprised us the most in our review. It features incredible sound quality, tough design, amazing battery life, stylish looks and the best battery life out there, by a country mile. In fact, I do not think there is another speaker on the market that manages to get this mix better or even match it. The best Bluetooth speaker under $100 without a doubt. The JBL Flip 4 is the most popular Bluetooth speaker in JBL’s line up and one of the most popular in general. In fact, it is one of the oldest ones on the market too, with the fourth generation being out now. At a glance – there is nothing special about this speaker compared to the previous model (i.e. Flip 3) or even the competition. The design is very similar to its predecessor, which is pretty plain and simple. In fact, the only external difference between Flip 3 and Flip 4 is the fabric-mesh weave that wraps around the speaker and makes it completely waterproof. The JBL Flip 4 comes certified to the highest IPX7 waterproof rating allowing the speaker to get submerged in water for up to 30 minutes. Another update is the JBL Connect+ feature that allows up to 100 other JBL speakers to get connected. You are likely never to need to interconnect so many speakers, yet pairing a couple could be quite reasonable. The JBL Flip 4 also features two new and larger 1,57″ drivers that make it sound a little louder, better and have an improved bass response as well as a sound clarity. The mids are less refined than we hoped for as they sound a little too hard with vocals coming across somewhat abrasive. The overall sound, however, feels balanced with no frequencies taking the front stage. Conversely, the sound lacks dynamism as although the presentation is wide, it is also quite flat. We found UE Wonderboom to be the closest competitor to Flip 4. They are relatively similar regarding sound quality and price, yet the latter has a microphone and offers a slightly better battery life. We also found the Flip 4 is more comfortable to carry around due to its shape. On the flip side, we found the UE Wonderboom’s sound to be slightly more detailed and rich. The connection quality the speaker provides is quite stable. In real-life conditions, the connection stayed strong and reliable at a distance of 40 feet, even with the walls in between. As for the battery life, it depends on the usage. JBL claims the speaker should last for around 12 hours, yet our numbers are slightly different. We found the battery to last for 4 hours when listening on a full volume and over 14 hours on 50% volume, which more than the claimed specification. The JBL Flip 4 is a great all-around portable speaker that delivers good sound quality. It does not excel in any particular area but rather represents a practical, versatile and comfortable package which you would like to have with you wherever you go. There are many speakers that are affordable, durable, travel-friendly and have a decent sound quality but only few that can do it all – JBL Flip 4 is one of them. The UE Wonderboom is the latest and smallest addition to the Ultimate Ear’s line up of Bluetooth speakers. The first thing that you notice is a weird shape of the speaker as it actually looks like a squashed, fat can of coke. The speaker is wrapped in a typical UE type of water-proof fabric with soft rubber top and bottom making it shockproof, capable of surviving 5 feet drops. With IP67 rating, the UE Wonderboom is waterproof and dustproof making it the toughest speaker in Ultimate Ear’s lineup. The certified rating allows the speaker to get immersed in up to 1-meter deep water for up to 30 minutes. At the same time, this is unlikely ever to happen as the UE Wonderboom knows how to swim and can float in water! In terms of connections – the speaker only supports Bluetooth with no physical connections being available. The connection range is pretty decent as we had used it up to 80 feet away (outdoors) before any skipping started to take place. You can pair the UE Wonderboom with another speaker quite seamlessly, and it does not require a mobile app. All you need is to have the UE button pressed on both speakers, and voila, you’ve got the connection! Since UE Wonderboom is a relatively small speaker, we did not expect a powerful sound. I cannot tell you how wrong we found ourselves. The speaker is loud, really loud! In fact, it is much louder than some of the bigger size speakers we have tested. You do not get the cleanest sound here as the highs are not as crisp and the mids need a touch of refinement. The lows are quite solid for the size of the speaker, yet they don’t sound overly controlled. Overall, the UE Wonderboom produces a decent sound for the size without rattle, fuzziness or harshness. The battery would be our only real complaint with UE Wonderboom. It is advertised to last for 10 hours, and in practice, we found it to be rather an optimistic claim. In our test, on full volume, the speaker lasted around 2 hours. When used at average volumes, we managed to get just above 8 hours of life out of it. Not too bad, but also not too exciting compared to the competition, as we would like to see Ultimate Ears deliver stronger results. We really liked the UE Wonderboom as it punches well above its weight. It is ridiculously loud and has an almost indestructible waterproof and dustproof chassis. Like many other smaller speakers, the UE Wonderboom promises a big sound from a small package, but unlike others – it delivers on its promise. 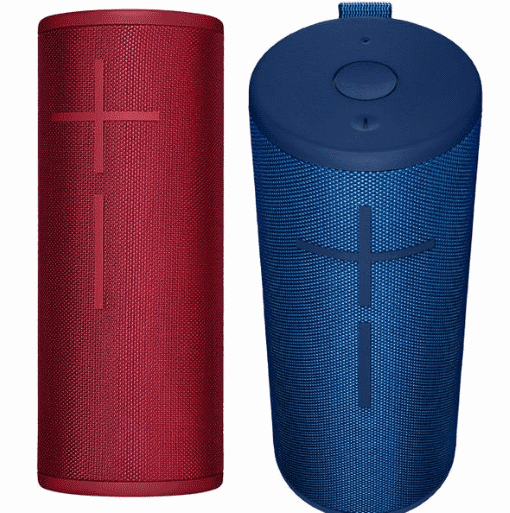 If you are looking for a relatively affordable mini size speaker for outdoor use that is also tough – the UE Wonderboom is one of the best options around. 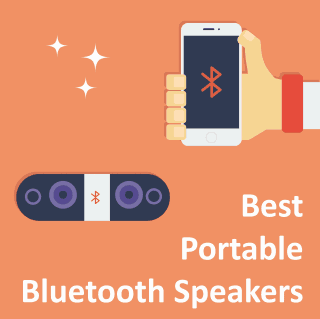 JBL is a well-known name in the world of Bluetooth speakers that offers one of the most extensive ranges of portable audio equipment out there. The latest JBL Charge 4 continues the tradition of one of the longest standing and the most successful Bluetooth speakers on the market. The new wireless speaker is slightly bigger by around a centimeter and heavier by around 165 grams than the previous model. It also comes with ten vibrant color options to add that personalization touch. The rugged cloth-and-metallic grill protects the speaker from physical damage and features an IPX7 waterproof certification allowing you to submerge the speaker in water for up to 30 minutes. Hence, if you are looking for a pool or beach companion, JBL Charge 4 is a great option to consider. The wireless speaker is easy to use with a control panel featuring volume up/down, power, pairing and play/pause buttons. When you press the play/pause button twice it will skip forward a track, but there is no backward navigation option. Battery life has received a little boost this time around taking it from 6000mAh on Charge 3 to 7500mAh. Since you can also charge other peripherals from the speaker, the 20% battery capacity increase goes a long way. In addition, it now provides up to 20 hours of playtime on a single charge. Like most JBL products, the Charge 4 comes with a powerful sound that favors lower frequencies. It has one mono audio driver that pushes 30 watts through the side-firing passive radiators to produce a rich sound with a deep bass response. The speaker can get pretty loud and seems to favor larger rooms and open areas so it’s a perfect companion for hanging out at the beach, park or backyard. Lastly, if you ever feel the need to link multiple speakers to deliver a richer, louder and more powerful experience, JBL Charge 4 comes with a Connect+ support. The technology allows to interconnect up to 100 JBL speakers together and get them all to play the same tune. If you are looking for a best Bluetooth speaker for parties, JBL Charge 4 is one of the top choices to consider. If you are looking for a large size portable speaker that delivers a large sound experience at a very reasonable price – the Charge 4 is worth your attention. It delivers a powerful, bass-rich sound that can get pretty loud. 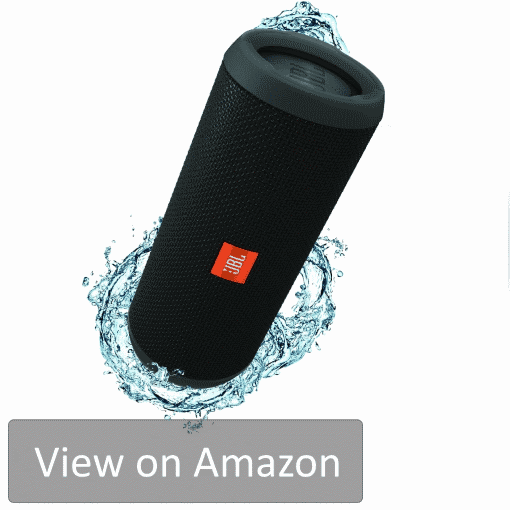 With improved waterproof rating and an ability to interconnect up to 100 JBL speakers – it is perfect for pool parties, beach and park use making it one of the best outdoor Bluetooth speakers for parties. The Bose is a name well known in the audio world, yet its entry into the Bluetooth portable segment is relatively recent and like with everything at Bose – it is done in style. 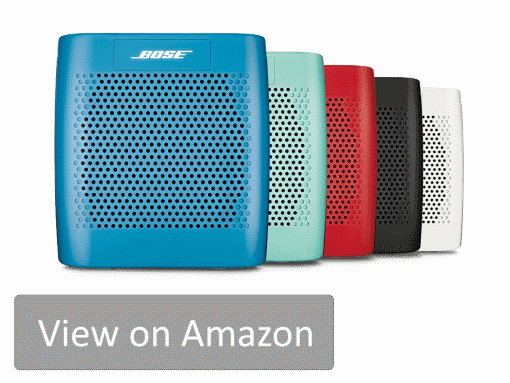 The SoundLink Color II is an improvement on the original model in almost every regard. The body is made of soft-touch rubber which gives you a good feel and grip, especially with wet hands. It makes the speaker sit comfortably in your hands and ads a good level of impact protection. On the downside, it is a dust magnet, so you may find yourself wiping it a little more often than you would have wanted to. As far as the new features go – you will find the integrated microphone which lets you answer phone calls and use your phone’s virtual assistants such as Siri or Google Now. It also features an NFC function for quick pairing, which is a small but handy improvement. Another uncommon feature for speakers of this size is the multipoint Bluetooth support that allows having two phones paired with the speaker. As for the sound quality, SoundLink Color II produces a surprisingly rich and dynamic sound for the speaker’s size. The tonal balance is excellent with clear sound reproduction across the frequency range. We found that it works the best with classical, jazz and any acoustical music as you get a nice and clear sound separation. It also performs well with Hip-hop type of music, yet when the music gets busy, you may find that the speaker ratches back the volume and some frequencies to avoid the sound distortion. In the battle of toughness, portability and sound quality, the SoundLink Color II favors the latter. It is still hugely portable and reasonably tough, but it is the sound quality that really sets it apart. We would like to see a better battery life as the claimed 8 hours is somewhat average compared to the competition. If you are someone who needs a semi-tough, portable speaker delivering arguably the best sound experience in its class – you will be delighted with the SoundLink Color II. The OontZ Angle 3 is the smallest and the lightest speaker in our review. It catches attention with an unusual triangular shape which actually is quite practical as it makes the speaker very stable. The body is made of a quality mesh with a more rugged mesh at the bottom. The side slipcovers are made of soft-touch rubber designed to absorb physical impact and help with water resistance. Although the speaker has the looks of a fully sealed waterproof device, it is not quite so. OontZ Angle 3 features an IPX5 rating which offers protection from the spray of water for 3 minutes coming from any direction. Although it is a good water resistance level, it is not fully waterproof, and hence the speaker should not be submerged in water. The 2200mAh integrated battery claims to have the speaker going for up to 12 hours, which we found to be conservative as our testing showed over 15 hours of play time. Quite a surprise for a budget speaker of such a small size. It takes about 5 hours to recharge the battery which is a little too long in our opinion. Amongst the new features, you will find the integrated microphone which allows the unit to be used as a speakerphone. 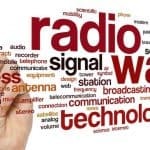 Cambridge Soundworks has advertised a 30 feet connection range, however in practice, we feel 20 feet to be more representative, as pushing beyond that range results in skipping. The body features two 1.77″ integrated precision neodymium drivers and a bass radiator delivering 10 watts of power. The speaker is relatively loud for the size, yet when you hit the last volume level, it tends to handle busy music with less consistency, at times resulting in a moderate sound distortion. Overall, the sound is clean across the frequency range with good vocal reproduction. 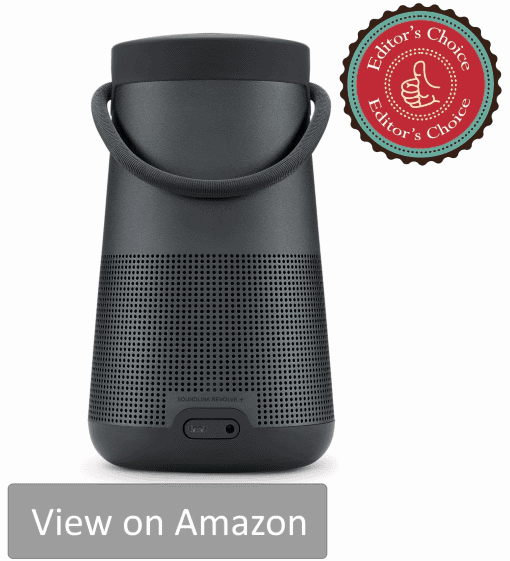 In summary – the OontZ Angle 3 is a great little speaker that made more than 17 thousand customers happy on Amazon. It offers loud and decent sound wrapped in a tough and rugged body in a size that fits your cup holder. It is extremely affordable and if you are shopping for the best budget Bluetooth speaker which is also durable – the OontZ Angle 3 represents an unbeatable value. 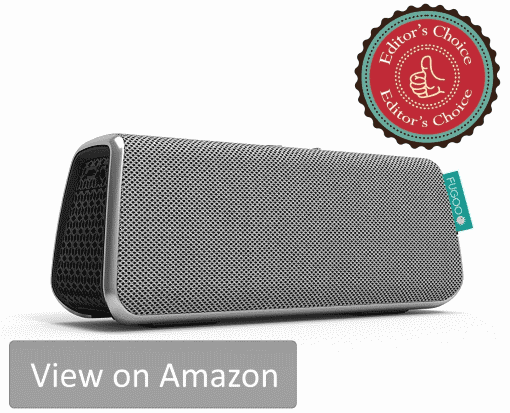 It is the best Bluetooth speaker under $50 available on the market today. Looking for the audiophile sound bar? We got you covered! 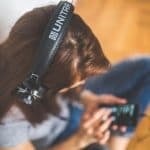 Our top Bluetooth headphones in 2019! Like music in the bathroom and need a waterproof Bluetooth shower speaker? Check our review! Do you like online and PC games? Check out our best open back headphones for gaming review. Figuring out the best portable speakers of 2019 has to offer is no longer just about the sound quality. There are multiple factors to consider as wireless speakers can now do a lot more than playing songs. Being able to carry the speakers anywhere you go is probably the most important aspect of portable Bluetooth speakers. As a result, things to keep in mind are weight, size, ease of carrying and battery life. The audio quality may not be your most important criteria when choosing the speakers, but I have to assume it is one of the top ones. Since we all love music, we all appreciate a good sound quality even when we are out on a picnic or the beach. Most of the time the sound quality and portability are working against each other. You see, to get a better sound, you usually need to have larger drivers. To power bigger drivers, you need bigger batteries. All of which generally ads more size and weight and consequently reduces the portability. We do have to admit though that some manufacturers have managed to strike a fantastic balance which almost pushes the limits of physics. Depending on your needs, you may require a portable Bluetooth speaker to have a rugged design. Some speakers come with shock protection or water resistance, some have both. Furthermore, if you need your speaker for an active sports use that has water or dust exposure, you may want to look for speakers that have an IP rating. There are mainly three types of connections – physical 3.5mm aux input, Bluetooth or Wi-Fi. Based on your needs, you will need to pick a speaker that support your connection type preference. Extra features may not be for everyone, yet some may find it quite useful. Those features may include built-in voice assistance support such as Amazon Alexa, ability to charge other devices, multi-room setup, light equalizer show and many more. Although the Bluetooth speakers are a lot more affordable these days than they were a couple of years back, some may still get quite pricey. Generally, the more expensive the speaker is, the better the audio quality it delivers. Conversely, you may find some speakers around a $50 price point that would amaze you with how capable they are. Good luck and we hope you’ll find the best portable Bluetooth speaker for your needs! The connection process between two or more Bluetooth devices is called ‘pairing’. You need to follow the pairing instructions for exact steps, however, most of the time the process is identical. You need to enable the pairing mode on the speaker first. Once done, go to your phone’s Bluetooth settings and enable the Bluetooth. You should see the speakers appear in the discovered list of your phone. Click on the device to complete the pairing. Can I pair Different Speakers Together? No, you can’t. Some of the manufacturers do allow multiple speakers to be paired together, yet that can only be done between the same model speakers. Now that you have the device paired, you will have a volume control on the speaker and a volume control on your source device. The easiest way to avoid the confusion is to set the volume on the speaker to 3/4 of the volume and then use the controls on your phone or tablet to control to adjust the volume. Will I get Interference with Bluetooth Connection? Yes, you may. It usually comes down the distance between the connected devices as well as the things in between them. Walls, people and other objects may cause an unnecessary resistance and impact the signal strength. Ensure that there is nothing between the devices and that you keep them within the range of each other. Does Bluetooth Degrade Sound Quality? Historically it definitely did, but a lot less now. The degree of degradation is mostly related to the quality of the codecs the manufacturer has used. With that being said, two devices using Bluetooth 4.0 may have different levels of impact on the sound quality. It could range from quite non-existent to someting that your ears will be able to easily pick. I think JBL Charge 3 is not longer being made, I’ve seen JBL Charge 4 on their website. Guys, just checking if you have had a chance to look into Sony XB40? Any feedback? Yes, we did and it is a great party speaker. The only reason why we have not included it in our top 10 is that we feel it is too pricey for what it is. Why OontZ Angle 3 and not OontZ Angle 3 Plus? Absolutely love my Fugoo, I am yet to find an application where it would not have worked perfectly. Yup, it is our personal favorite too, nothing comes close in terms of value in that price point.